NASA's Kepler Space Telescope is tasked with finding small, rocky worlds orbiting distant stars. However, exoplanets aren’t the only thing Kepler can detect — stellar flares, star spots and dusty planetary rings can also pop up in the mission's observations. But there's also been speculation that Kepler may have the ability to detect more than natural phenomena; if they're out there, Kepler may also detect the signature of artificial structures orbiting other stars. Imagine an advanced civilization that's well up on the Kardashev scale and has the ability to harness energy directly from its star. This hypothetical alien civilization may want to construct vast megastructures, like supersized solar arrays in orbit around their host star, that could be so big that they blot out a sizable fraction of starlight as they pass in front. When Kepler detects an exoplanet, it does so by sensing the very slight dip in starlight from a given star. The premise is simple: an exoplanet orbits in front of star (known as a "transit"), Kepler detects a slight dimming of starlight and creates a "lightcurve" — basically a graph charting the dip in starlight over time. Much information can be gleaned from the lightcurve, such as the physical size of the transiting exoplanet. But it can also deduce the exoplanet’s shape. Normally the shape of an exoplanet isn't particularly surprising because it's, well, planet-shaped. It's round. The physics of planetary formation dictate that a planetary body above a certain mass will be governed by hydrostatic equilibrium. But say if Kepler detects something that isn’t round. Well, that's when things can get a bit weird. For the most part, any dip in star brightness can be attributed to some kind of natural phenomenon. But what if all possibilities are accounted for and only one scenario is left? What if that scenario is this object appears to be artificial? In other words, what if it’s alien? In a chilling article written by Ross Andersen of The Atlantic, at first glance, it seems we may be at this incredible juncture. The research paper is thorough, describing the phenomenon, pointing out that this star is unique - we've seen nothing like it. Kepler has collected data on this star steadily for four years. It's not instrumental error. Kepler isn't seeing things; the signal is real. "We'd never seen anything like this star," Tabetha Boyajian, a postdoctorate researcher at Yale University and lead author, told The Atlantic. "It was really weird. We thought it might be bad data or movement on the spacecraft, but everything checked out." The Planet Hunters volunteers are depended on to seek out transits in Kepler's stars in the direction of the constellation Cygnus. This is a huge quantity of data, from over 150,000 stars in Kepler’s original field of view, and you can’t beat the human eye when identifying a true dip in starlight brightness. The Planet Hunters described KIC 8462852 as "bizarre," "interesting" and a "giant transit." They're not wrong. The transit data for KIC 8462852, featuring the obvious transit features D800 and D1500. The researchers worked through every known possibility, but each solution presented a new problem. For example, they investigated the possibility of some kind of circumstellar disk of dust. However, after looking for the infrared signal associated with these disks, no such signal could be seen. Also, the star is a mature F-type star, approximately 1.5 times the size of our sun. Circumstellar disks are usually found around young stars. ANALYSIS: Alien 'Star Engine' Detectable in Exoplanet Data? The researchers also investigated the possibility of a huge planetary collision: could the debris from this smashup be creating this strange signal? The likelihood of us seeing a planetary collision is extremely low. 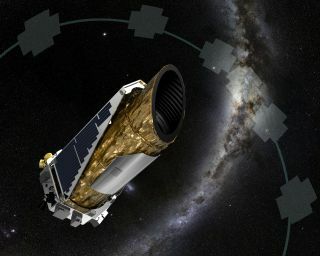 There is no evidence in data taken by NASA's Wide-field Infrared Survey Explorer (WISE) that a collision happened, creating a very tiny window of opportunity between WISE's mission end and the beginning of Kepler's mission (of a few years) for an astronomically unlikely cosmic event like this to occur. The only natural explanation favored by the researchers seems to focus on an intervening clump of exocomets. "One way we imagine such a barrage of comets could be triggered is by the passage of a field star through the system," write the researchers. Indeed, they argue, there's a nearby star that might have tidally disturbed otherwise dormant comets in the outermost regions of the KIC 8462852 star system. This small star is located around 1,000 AU from KIC 8462852 and whether it's a binary partner or an interstellar visitor, its presence may have caused some cometary turmoil. Like the other scenarios, however, the exocomet explanation still falls short of being fully satisfactory. This research paper focuses only on natural and known possible causes of the mystery transit events around KIC 8462852. A second paper is currently being drafted to investigate a completely different transit scenario that focuses around the possibility of a mega-engineering project created by an advanced alien civilization. This may sound like science fiction, but our galaxy has existed for over 13 billion years, it's not such a stretch of the imagination to think that an alien civilization may be out there and evolved to the point where they can build megastructures around stars. "Aliens should always be the very last hypothesis you consider, but this looked like something you would expect an alien civilization to build," Jason Wright, an astronomer from Penn State University, told The Atlantic. Indeed, hunting down huge structures that obscure the light from stars is no new thing. The Search for Extraterrestrial Technology (SETT) is one such project that does just this. Only recently, a survey of the local universe focused on the hope of detecting the waste heat generated by a technologically advanced civilization, specifically a Type II Kardashev civilization. On the Kardashev scale, a Type II civilization has the ability to utilize all the available energy radiating from a star. Using a vast shell or series of rings surrounding a star, a Dyson sphere-like structure may be constructed. This has the effect of blotting out the star from view in visible wavelengths, but once the solar energy has been used by the alien civilization, the energy is shifted to longer wavelengths and likely lost as infrared radiation. ANALYSIS: Could We Detect an Alien Civilization’s Waste Heat? This recent search for aliens' waste heat drew a blank, reaching the conclusion that as there appears to be no alien intelligence cocooning stars to harvest their heat, there’s likely no Type II civilization nearby. But as KIC 8462852 is showing us, there may be something else out there — possibly an alien intelligence that is well on its way to becoming a Type II civilization, which is setting up some kind of artificial structure around its star. Of course, these mystery transit events are nowhere near "proof" of an alien civilization. In fact, it's barely evidence and a lot more work needs to be done. The next step is to point a radio antenna at KIC 8462852, just to see whether the system is generating any artificial radio signals that could indicate the presence of something we'd define as "intelligent." Boyajian and Wright have now teamed up with Andrew Siemion, the Director of the SETI Research Center at the University of California, Berkeley, to get a radio telescope to listen into the star and if they detect an artificial signal, they will request time on the Very Large Array (VLA) to deduce whether any radio signals from that star are the chatter of an alien civilization. It might be a long shot, and the phenomenon is more likely a clump of comets or some other natural phenomenon that we haven't accounted for blocking star light from view, but it’s worth investigating, especially if there really is some kind of alien intelligence building structures, or perhaps, ancient structures of a civilization long-gone, around a star only 1,500 light-years away from Earth.